Panic and paranoia, as a result of the decades sprawling Cold War and atomic anxiety, can be seen in numerous monster and spy films from the period in which this conflict took place. Netflix’s Stranger Things pays homage to a number of these, with nods to Steven Spielberg, John Carpenter, and Stephen King among many others, by having a shadowy government be responsible for the havoc which is taking place. An actual monster has come to Hawkins, Indiana, along with these men in suits and lab coats who use national security as an excuse for their dangerous and unethical experiments. Arrogance and bravado cannot keep you safe from what hides in the shadows. Stranger Things is set in November 1983, and this was also the year that Ronald Regan made his ‘Evil Empire’ speech and ABC aired The Day After. It was a fraught period towards the end of the Cold War in which the last vestiges of Communist fears were playing out on screen and behind closed doors. The Americans also deals with this same, latter-day Cold War era that covers Regan’s speech and this seminal TV movie, which highlights their impact politically and in pop culture. The push/pull between both nations and their desire to protect their country comes with deadly risks that produce a monster of a different kind — one that can liquefy your organs and cause a deadly epidemic. Both series deal with the monsters of the day in different ways, and both show the impact they have on children, and on innocence. So what does it speak to that, in 2016, the popularity of these 80s-styled Cold War and government-inspired monsters are making a comeback? 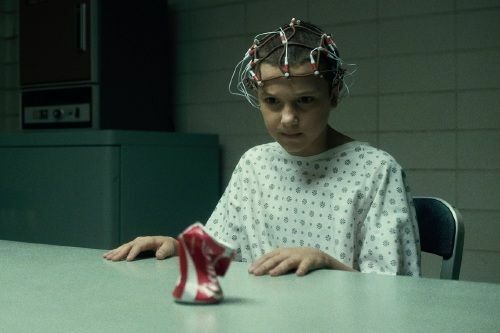 The monster in Stranger Things is a side effect of the experiments that have been conducted on Eleven as they use her abilities to spy on their enemies through psychic means. This causes a tear between dimensions, bringing about both the ‘Demogorgon’ and the Upside Down plain of existence. Eleven’s origin story starts with something based in the real world, as her mother was part of Project MKUltra; a deeply disturbing and insidious illegal program run by the CIA, giving rise to the “government as a super shady organization” trope. But the line between truth and fiction is often blurred. 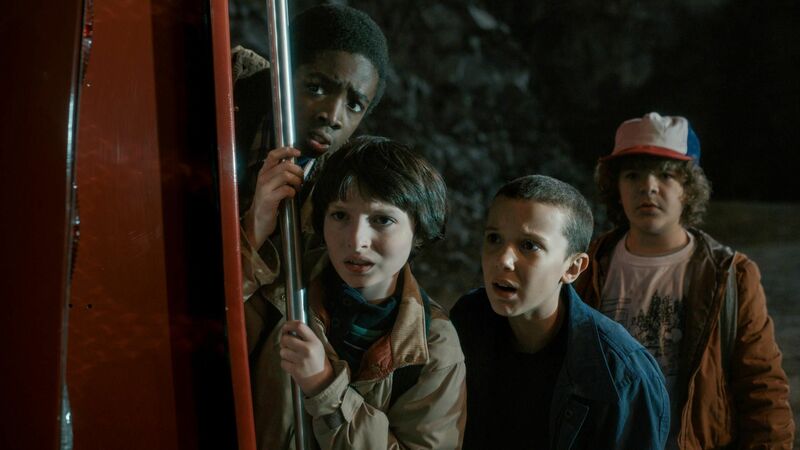 Project MKUltra was officially halted in 1973, and Stranger Things explores a world in which these experiments continue as a method of spying on their enemies. The enemy in this case are still the Russians, and Eleven manages to make contact with the intended target before the monster’s snarling interrupts this new frontier of spy technology causing death, destruction, and havoc. The idea of containment is also called into question on The Americans with deadly bioweapons taking the position of the terrifying monster. The Lassa virus won’t take you to another dimension but it will make “your blood come through your skin” and the concerns of the man (William) tasked with bringing this to the Russians are both ideological and practical, as the Russians very simply lack adequate storage containers. 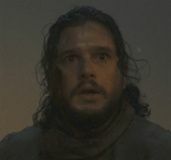 The incident with the Glanders strain in Gabriel’s possession gives weight to those fears regarding the dodgy threads, and how easily someone contracted it. In the Season 4 episode “The Day After,” William tells Philip about what the Lassa virus does, and lays out his reasons for keeping this news from their bosses; it is all about escalation, and the weapons they have are never enough. The most vital part of his argument is that “nobody needs this,” but a statement this sensible is not going to stand in the way of these two superpowers when the fight for dominance is still in play. This argument can be made as an attempt to excuse a lot of bad decisions regarding national security, and ultimately, it is the younger generations that suffer. Eleven is only where she is because her mother was pregnant when she took part in these experiments; her abilities are a result of these scientific tests, and her life becomes one long extension of this work. However, Eleven is far more than something to be poked, prodded and exploited. The monster here brings about death and destruction, but it also gives Eleven something she has never experienced before: her freedom. Freedom to be a girl rather than a weapon or communication device, and able hang out with other kids her age who quickly shorten her name to El. Taking this impersonal number-name and shortening it is an instant marker of friendship; this is their name for her and not one cooked up in a lab to reduce her agency. Paige Jennings on The Americans was also born into an experiment of sorts: can you fake the kind of family that will make you appear American? It turns out for her parents Philip and Elizabeth that the answer to this is yes, but there are some things they can’t imitate, as Paige sensed something was off about this set up and finally confronted her parents in Season 3. Now Paige knows the truth, and thanks to her own indiscretion about this top-secret information, she is now fully immersed in the family business. While this doesn’t involve electrodes and a cell for a room, the illusion that is her life has been shattered and this new frontier waits. It’s one in which she is now helping her parents protect their identity and gather intel that will help their cause. Family and duty are so entwined on The Americans and the threat of this family being destroyed was leveled at Paige to get her in line. A loss of innocence is a big theme in coming of age tales, with movies like Stand by Me dealing with this subject in a very intimate and personal setting. Stranger Things takes on a similar form and nods to Stand by Me in a big way – train track treks and calling an episode “The Body,” referencing the Stephen King story from which Stand by Me was adapted – while dealing with a small town and a national conspiracy. 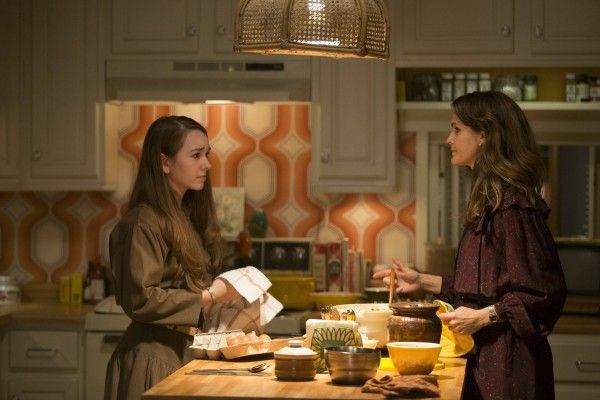 The Americans plays with different aspects of innocence as Philip and Elizabeth both grew up in an environment that taught the harsh realities of the world at a very early age in post-war Russia. For their children, it is a far cry from this bleak beginning; however their home is built on a foundation of lies. And sometimes, deadly biological weapons are stored in their freezer. Danger lurks, and the last shot of Season 4 of the looming Jennings house appears to be straight from a horror movie, suggesting that what was once their sanctuary could also be their downfall. In 2016 there are different global horrors, and with that, uncertainty and dread takes another form. With the internet, and particularly social media, it brings events from thousands of miles away into the palm of your hand; tragedies are seen in real time and the immediacy, frequency, and unpredictable nature of attacks adds to this feeling of helplessness. Part of the appeal of Stranger Things lies in nostalgia — is this also a sign that we are not only nostalgic for a certain kind of movie, but for an abstract conflict which mostly took place behind closed doors? There was no 24 hour news cycle in 1983, and the closest thing to smart phones was walkie talkies with minimal range. It is not that these were necessarily simpler times, but threats seemed further away and wall-to-wall coverage didn’t exist as it does now, picking apart one tragedy until the next one takes place. Although if there is nostalgia for older conflicts, then recent email hacks are playing into this trend in a most unwelcome fashion. Secrecy is a much harder concept to maintain in 2016 than 1983. 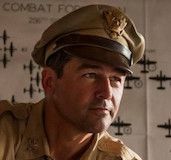 Whether it’s super powers as a result of government experimentations (based on real-life events) or biological weapons created in a lab, the Cold War and the threat of nuclear annihilation is a period Hollywood keeps returning to. 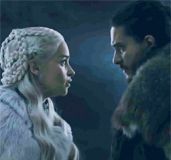 Nostalgia comes in many forms with politics, music, clothes and pop culture references ticking all those boxes and reminding us of time that, in this preset climate, might seem preferable. Rose-tinted (preferably heart shaped) glasses will do that. 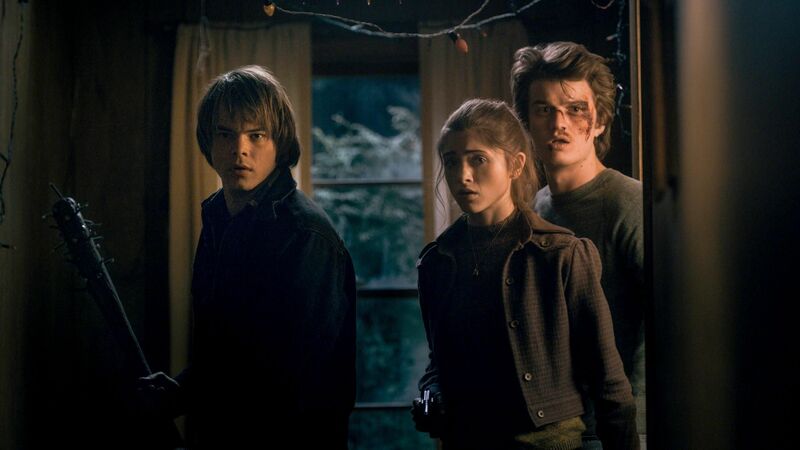 Stranger Things and The Americans both take on the same year, and while their monsters take very different forms, issues of containment, arrogance from those in charge, and corruption of youth all play a vital role.